Discussion in 'General Discussion' started by vwmad1mk2, Feb 10, 2019.
was looking today at the ford seats looks like they've butchered the t2 frames to fit ford ones why oh why ! Seats needs recovering the passenger seat has had a frame fitted to support the back as the bulkhead was removed from the van. This should be able to removed easily but the hinge points will need some work. But a decent pair can cost more than the van. these sit about 1" lower than stock seats btw. i looked at several options and chose these cos i didn't want to drill any new holes, plus some of the other options people use end up with you sitting higher up which i wanted to avoid. the mx5 seats are way more comfortable that my refurbished og seats, also have heater elements although i've not hooked those up yet. DPS DAN, PIE, monkeyvanwestybike and 3 others like this. They're very Gentleman's Club Matty. I'm amazed @davidoft hasn't had your hand off for them. They'd go lovely with his smoking jacket and paisley cravat. snotty, Iain McAvoy and davidoft like this. They look great. Was it much to get them retrimmed? Never liked my seats in black. Porsche tombstone fit nice and look great in my opinion. I have these also. Mine came out of a Boxster. it wasn't cheap, but a super quality job so i was happy to pay. 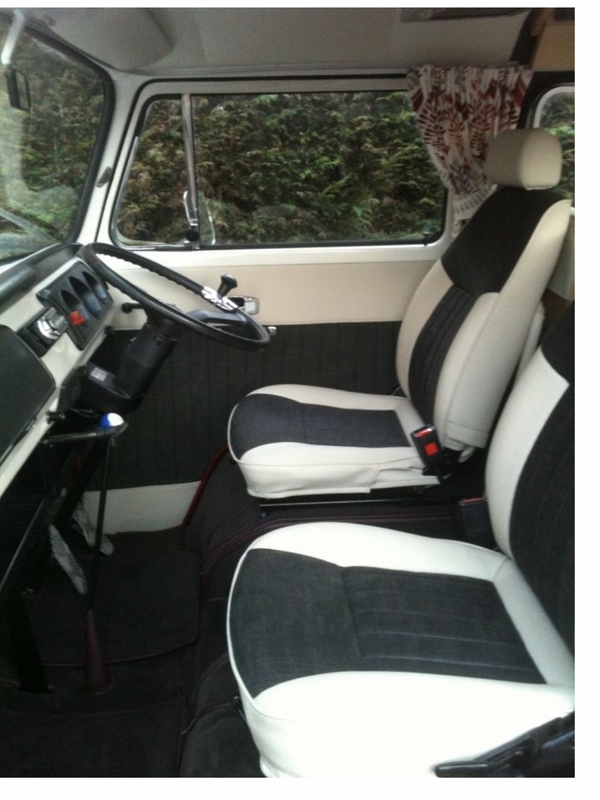 i sold my original westy seats so overall it was cashflow neutral (ish). vwmad1mk2 and VW-Pete like this. You may as get some tatty ones, 'cos they'll fade anyway in the Barnsley sunshine. Betty the Bay likes this. Being over 6ft tall, but having little short legs, means I need as much headroom as I can get. 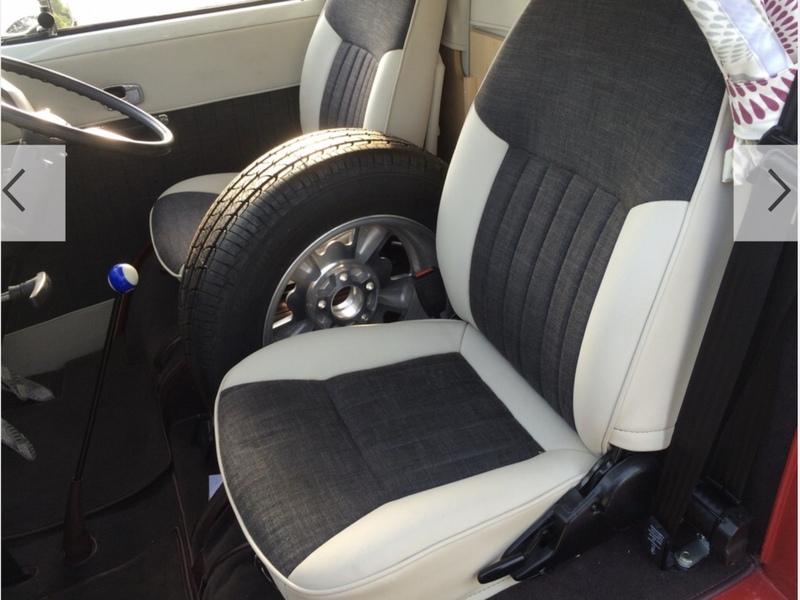 I noticed how the inner wheel arches dip under the original seats and remembered how some seats on old Toyota vans have thin bases that also have a ‘bulge’ for padding underneath. I picked a pair up from a local breakers yard for £25 and had them recovered when we had the van interior done. 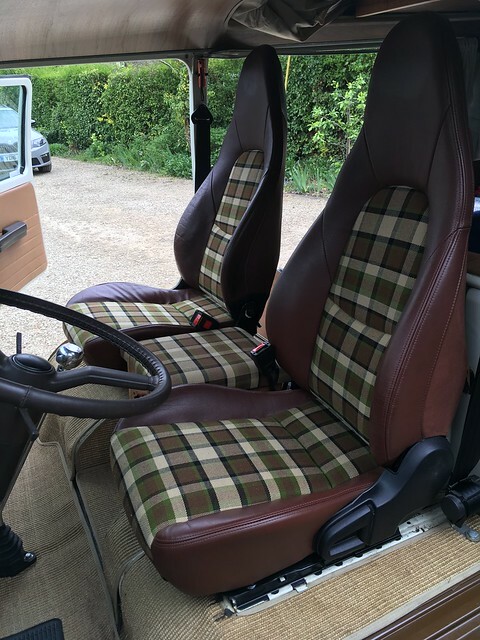 They are great as they have adjustable headrests and the levers to tilt the backs forward and store bits behind against the walkthrough bulkheads. The thin bases gave me additional headroom too. I just had to make brackets for the runners and drill/plate the inner arches where the bolts go through. scrooge95, Meltman and vwmad1mk2 like this. cool seats the backs look nice and low may look into them what they from a Hiace ? I do believe it was an old Hiace van I took them out of.